It is getting cold outside which means it’s soup, stew and chili season. It really is the best time of year. 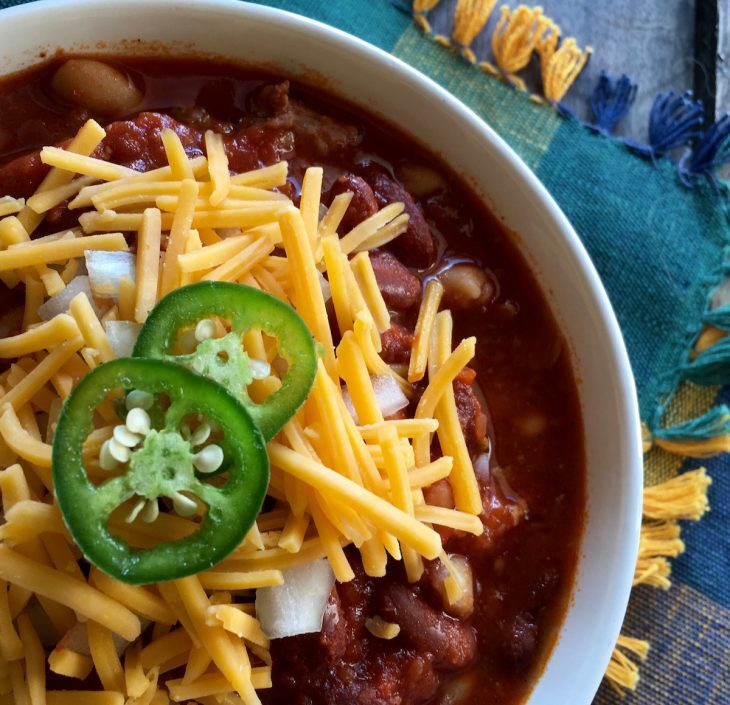 This spicy slow cooker chili recipe gets a nice boost of flavor by using a combination of spicy and sweet pork sausage, rather than ground beef. If you like your chili to be extra spicy use all spicy sausage. If you are like me and have no tolerance for spicy food use all sweet sausage. This recipe is written for those who like life a little spicy and a little sweet. Tip: Crumble the bulk sausage with your fingers prior to browning. This gives you better control over the size of each piece and is easier than breaking up the chunks of sausage with a wooden spoon while cooking. In a large skillet, brown pork sausage over medium heat until no longer pink. Remove from heat and drain excess fat from pan. Transfer browned sausage to slow cooker crock. Return skillet to burner over medium-high heat. Deglaze pan with chicken or vegetable stock, scraping up browned bits from bottom of pan with a wooden spoon. Add olive oil, garlic, and onion to pan and cook, stirring frequently, about 3-4 minutes or until softened. Add celery and carrot and continue cooking another 2-3 minutes. Remove from heat and pour skillet contents into slow cooker. Add white beans, red beans, tomato puree, tomato paste, petite-cut tomatoes, chili powder, cumin, oregano, and cayenne pepper to slow cooker. Stir to combine all ingredients thoroughly. If desired, add water or black coffee to thin mixture before cooking. Cook on high for 4 hours, or low for 8 hours. When finished, stir and add salt to taste. Adjust other seasonings, as desired. Spoon into bowls and top with shredded cheese, chopped onions and/or sliced jalapeno peppers. Serve immediately. Freeze or refrigerate leftovers within 2 hours.